**updated to add** it’s getting to be Halloween time again and I always get a ton of emails about this costume. I made this 4 years ago for my son. I didn’t use a pattern, I don’t know of an ewok pattern and I no longer have the costume. The only suggestion I have is that if you’re going to make one be careful what you use because this type of thick, stiff fake fur is not really meant for an allover costume – too hot! the small, furry Ewoks live in harmony with the natural world around them. ok, here’s Oscar’s Halloween costume. He’s Wicket W. Warrick, the Ewok from Star Wars: Return of the Jedi. Being the brilliant first-time Mom that I am I though ‘oh, how he’ll love to be all snuggly and warm in a furry costume on a crisp October night!’ Of course the fake fur is heavy, hot and itchy. Of course, this is the boy that screams like you’re pulling off his toes when you put any clothes at all on him. Of course he hates anything on his head. And, oh yeah, of course it’s 75 degrees in Chicago this Halloween! Here’s Wicket with Aunt Katie the Star Wars fanatic and the originator of the Ewok idea. Thanks KT! It’s a good thing that many of the items in Oscar’s thriftstore-bought wardrobe look like Halloween costumes anyway. A backup plan is underway. Well he looks adorable. Good work mom. I bought my eight month old a turtle costume and he crys when ever I put it on because he can’t move. Obviously all those child models in the pictures are hyped up on sugar. oh, man…those pictures are fantastic. It reminds me of when I was seven and BEGGED my mother to make me a dress for halloween in this fabulous shimmery purple fabric. My mom’s never been a big sewer, so this wasn’t a quick little project for her to crank out. Turned out that the purple fabric, while shimmery, was also hellishly itchy — naturally, I was cranky and miserable all night. That is, quite possibly, the cutest thing EVER. oh my gosh. oscar looks as though he is being absolutely tortured, but it’s so funny i can’t help but laugh. have a boo halloween! Adorable, but initally it scared the bejeezus out of him and he HATED it. Until we got out amongst people who gushed over how cute he was and gave him candy. But an ewok? That’s just plain brilliant. I think the part I love the most is that he matches the cat! Awesome costume. He is adorable! Too cute! And btw I love your site you are so talented. Ok now my husband thinks you are amazing too! He happened to walk by as I was looking as this, and he thinks the costume is perfect and can’t get over how great it is. I think he’s a little bit jealous that he doesn’t have one like it! Hope Oscar has a great Halloween. Genius. Sheer genius of a Halloween costume! what a precious costume and what a precious baby! I love the Ewok costume! And so does everybody in my office – I just had to share. 🙂 Great job! Hope you guys had a fun time trick-or-treating. That has to be the cutest costume i have ever seen!!! I know I shouldn’t laugh either, since I witnessed the torture, but that first picture is priceless. Good thing I was the one who actually pulled the costume off of him after the photoshoot, so he thought that I was ‘kind Aunt Katie’ instead of actually being the one who suggested such a torturous outfit. I don’t know if the pictures even do the costume justice – it was unbelievable. It was so big and fuzzy that it actually made Oscar walk like an Ewok! Even though he hated it, it was amazing creation. I have been dead set on having my son be an Ewok for halloween this year. 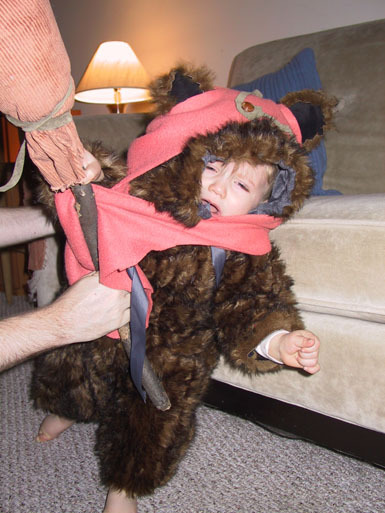 I googled “ewok costume” and got this site. That costume is adorable. How did you make it and do you have any suggestions on How to make one maybe a little more comfy for my 8 month old? He’ll be 10 months around halloween time. That costume is TOO cute! Where did you get the costume? My oldest (who will be 5 at Halloween) is going to be Princess Leia this year and we thought little sister (who will be 16 mos at the time) would make an adorable Ewok companion (clumbsy/waddle walking comes naturally!). 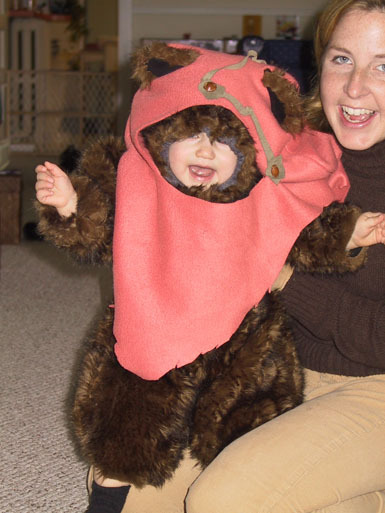 I would appreciate any leads that you may have for obtaining an Ewok costume. Thanks!